This post hole digger features a 5.5 horse power Honda engine with 10-inch pneumatic tires, roll cage, and a 10:1 transmission. Applications include fencing, deck work, landscaping, sign installation, soil sampling, and horizontal boring. 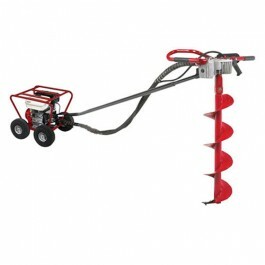 Auger sold separately. Our Little Beaver post hole digger is lightweight, powerful, and extremely reliable. Operating at 360 RPM’s, our augers rotate much faster than competitive units. Little Beaver technology increases your drilling productivity and results in cleaner holes. Mechanical drill reachers areas inaccessible to skid-steer loaders. When traveling over manicured turf areas, the rolling wheeled carriage leaves no marks, eliminating costly turf restoration. This post hole digger features a 5.5 horse power Honda engine with 10-inch pneumatic tires, roll cage, and a 10:1 transmission. Auger sold separately.